Florals for spring aren’t exactly groundbreaking. But we can’t deny their versatility and timelessness, be it on a bag, demure printed dress (case in point: the flowery ensembles from Louis Vuitton’s Pre-fall 2019 collection), watch strap, and as components of fragrances. Jewellery is also an excellent medium for botanical designs, with its coloured gemstones that easily conjure up images of vividly hued blooms, and precious metals that can mimic the graceful silhouettes of petals and stems. Which is why several brands have turned to flowers for creative inspiration, and rolled out spectacular floral-inspired jewels in time for spring. Chanel, for instance, released its 1.5 1 Camélia 5 Allures high jewellery range last month. The collection dresses the label’s iconic camelia motif in an exquisite assortment of rubies, diamonds, pink sapphires and rose gold; and spans brooches, multi-strand necklaces, bracelets, earrings and rings. 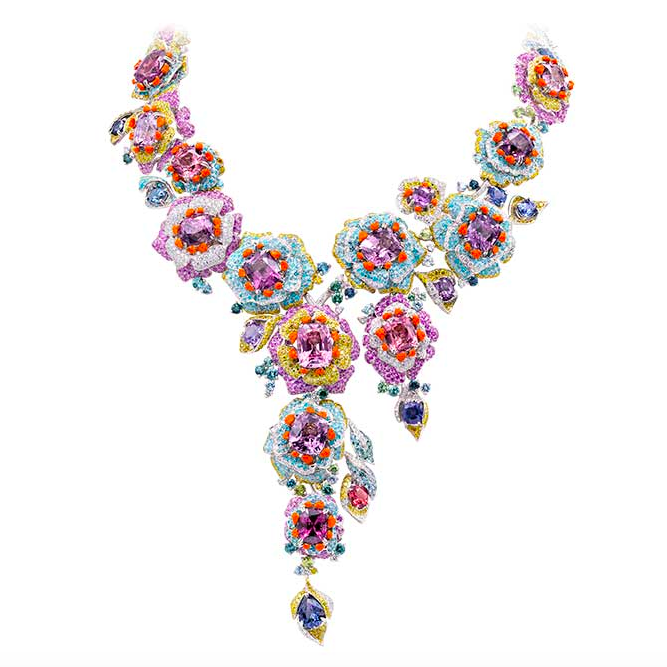 Other notable examples include Bulgari — which recently launched its Fiorever collection decked out with four-petal flowers — and Italian designer Alessio Boschi‘s flamboyant Rose de France necklace that was exhibited at the Vicenzaoro jewellery fair in Italy from 18 January to 23 January. Scroll down for a closer look at some of our favourite floral-inspired jewels. 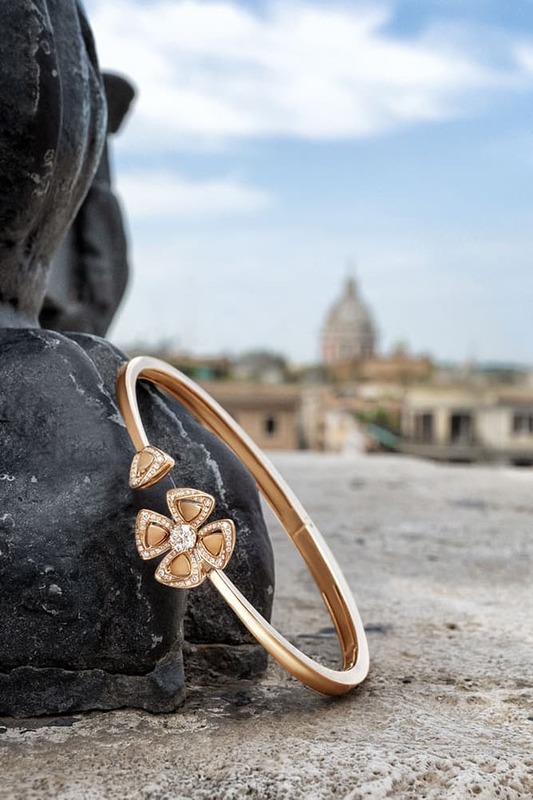 Launched last December, Bulgari’s Fiorever jewellery collection showcases a four-petal flower motif adorned with diamonds and crafted in pink or white gold. A single solitaire — ranging from 0.10 carats to 0.50 carats — is planted in each flower’s centre, while several designs feature petals that are filled or fringed with smaller diamonds. A highlight is this simple but elegant 18k rose gold open cuff bracelet, which is set with pavé diamonds along its petals and topped with a 0.20-carat sparkler. Last year, Tiffany & Co unveiled its Paper Flowers high and fine jewellery collection, which — as its name suggests — comprised intricate pieces modelled after paper flowers. Among its highlights are these gorgeous earrings, which feature slender loops of platinum wound together in intricate floral motifs, and ornamented with round brilliant diamonds. The bejewelled flowers are connected with platinum pins, and speckled with round and cushion-cut tanzanites for pops of colour. Chanel’s camelia motif gets an ultra lavish update in its new 1.5 1 Camélia 5 Allures high jewellery line. The flower is translated into 50 resplendent creations, 23 of which are transformable. 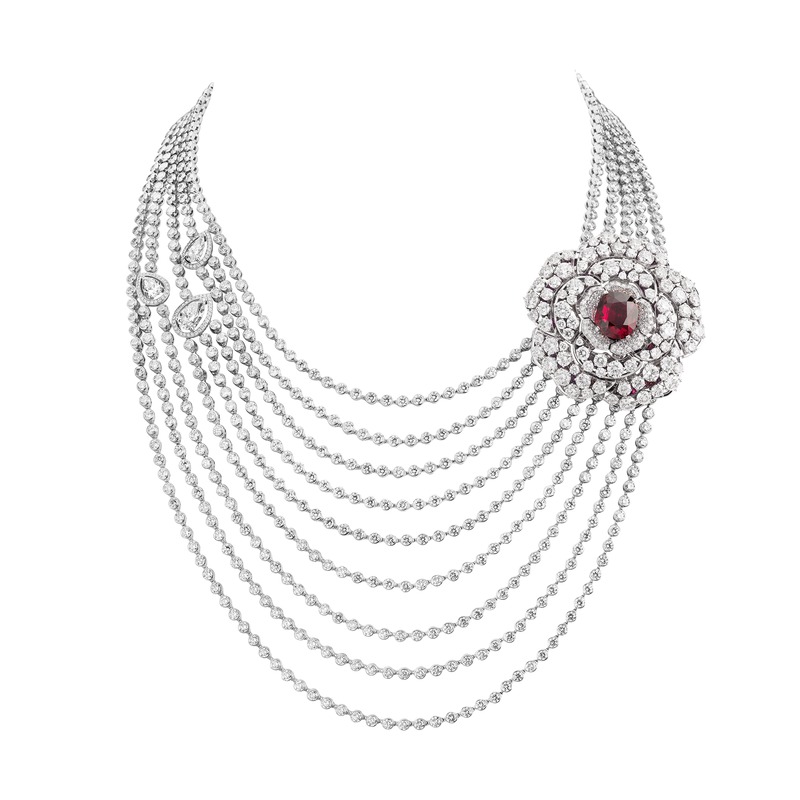 A showstopper is the white gold Rouge Incandescent necklace, which is composed of nine strands of diamonds bedecked with the camelia emblem and a massive ruby resting at its heart. The necklace is a convertible design that can be worn in five different ways, including as a brooch. The camelia can also be taken apart to reveal a second flower beneath, which is decorated with diamonds and pink sapphires. These dainty dangling earrings from Kiki McDonough’s Signatures collection comprise yellow gold studs pavéd with diamonds and shaped in four-leaf clover motifs. 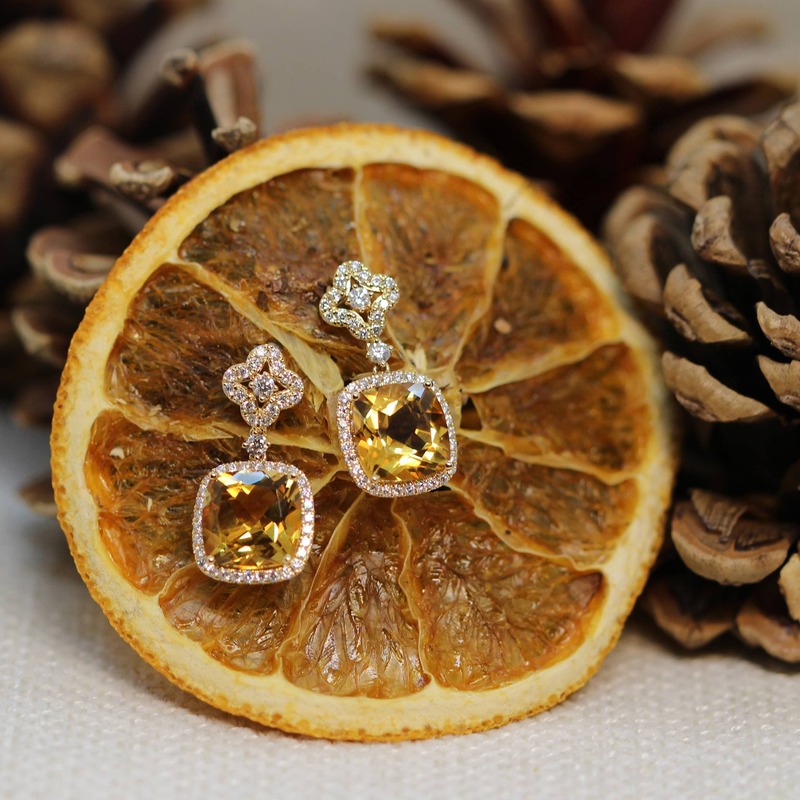 They are set in 18k yellow gold and festooned with cushion-cut citrines, which are flanked by more diamonds. The British jeweller, who counts Duchess of Cambridge Kate Middleton among her loyal clientele, also offers similar renditions in peridot, amethyst and lemon quartz. 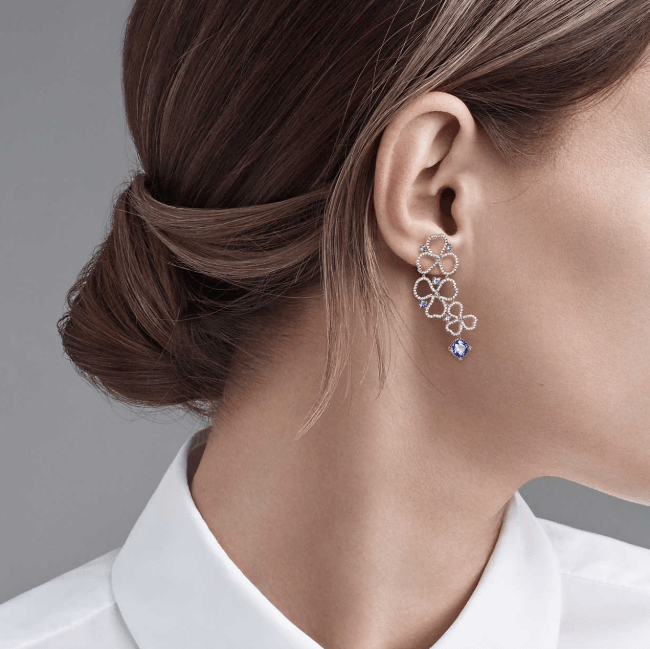 Van Cleef & Arpels’ signature Alhambra line saw an update late last year with the introduction of new materials such as blue agate and gold mother-of-pearl, as well as design techniques like guillochage. 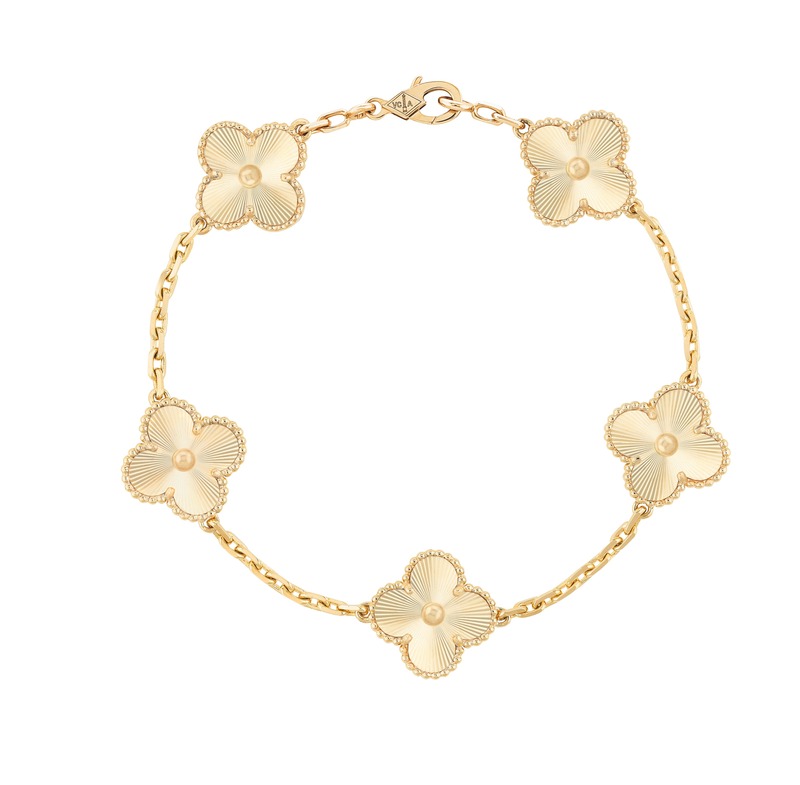 The latter is an engraving method that leaves sunburst-like incisions on mirror-polished gold, and is best illustrated in this yellow gold bracelet with five four-leaf clover motifs. Each flower is fringed with tiny golden beads, and mounted with a larger central bead for maximum shine. Known for her one-of-a-kind, gloriously elaborate creations, Taiwanese jeweller Cindy Chao added this verdant stunner to her 2018 Black Label Masterpiece repertoire in November. 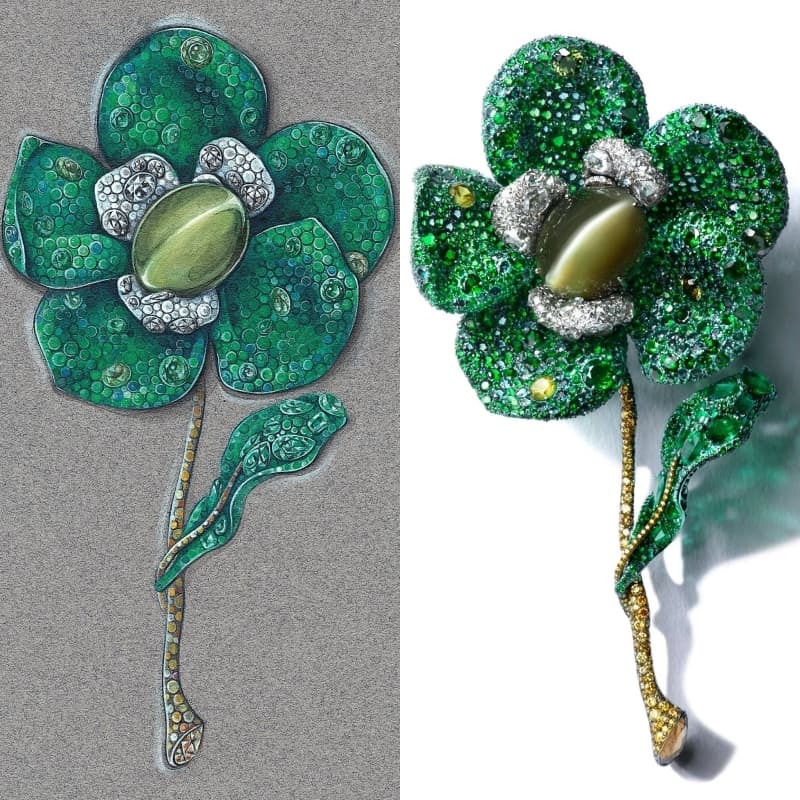 The brooch’s titanium petals are encrusted with nearly 2,500 green gemstones in six different varieties such as emeralds, tsavorites and green sapphires. Yellow and brown diamonds are scattered across the brooch, and form the flower’s stalk and branch. The jewel’s pièce de résistance is its central stone — a lustrous 105-carat chrysoberyl cat’s eye that gleams from any angle. This eye-popping necklace by Italian designer Alessio Boschi was displayed at the recently-concluded Vicenzaoro jewellery fair in Italy. It resembles a colourful cluster of blooms, with its opulent assemblage of Paraiba tourmalines, diamonds, pink sapphires and spinels in various hues, punctuated with orange enamel details. Some of the petals are designed to be en tremblant, so they quiver gently when moved — calling to mind the delicate swaying of flowers in the wind.